Jason Gillespie spent five years as Yorkshire's first-team coach. Jason Gillespie has admitted “you never say never” when asked about the possibility of rejoining Yorkshire in the future. Gillespie won two Specsavers County Championship titles as coach of the White Rose before leaving Headingley last September. He has since returned to county cricket for a short and successful spell as assistant coach of Kent, which comes to an end this week. The fast bowling legend returns to his native Australia before taking on a position as coach of a national A tour to South Africa. Gillespie has taken on a number of a short-term roles in recent times, including as coach of Big Bash side Adelaide Strikers. The 42-year-old was back in Yorkshire last week for a brief catch up with old friends before returning to Kent to help them prepare for Thursday’s Championship clash with Durham at Canterbury. When I stepped down at Yorkshire last year, I certainly didn’t think I’d be back at another county so quickly. The nature of the business we’re in, who knows what’s around the corner. At the moment, the short-term opportunities appeal. He leaves them firmly in the promotion picture. “I’ve really enjoyed my time with Kent,” he said. Despite being otherwise engaged with Matt Walker, Sam Northeast and company, ‘Dizzy’ has still found time to keep track of White Rose results. “The first one I look at is the Yorkie boys to see how they’re going,” he said. “I’ve had some great memories with them and have made some great friends. “They’ve had a fine start to the season at Yorkshire. “They’ve done incredibly well in the 50-over comp, and they’ve played some pretty good cricket in the Championship as well. And when asked about a return to county cricket and, more specifically, Yorkshire in the future, he admitted to being open to the prospect whether it be in time for the new T20 competition in 2020 or even beforehand. “You never say never,” he said. “When I stepped down at Yorkshire last year, I certainly didn’t think I’d be back at another county so quickly. The nature of the business we’re in, who knows what’s around the corner. “At the moment, the short-term opportunities appeal. The T20 is around the corner, and that would be something that would appeal to me, being involved with a county for a short stint in T20. That ticks all the boxes really. “I’m trying to get as much experience as a coach in T20 as I possibly can. I’ve had two seasons as head coach of the Strikers in the Big Bash and am certainly looking for more opportunities in the shortest form of the game. 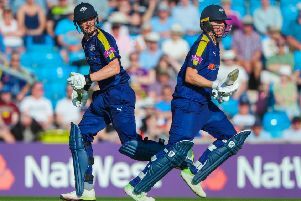 Yorkshire, fresh off a Roses Championship win inside three days at Headingley at the weekend, travel to Taunton on Friday to tackle struggling Somerset looking for a third win in six matches this season. Coach Andrew Gale will almost certainly name a second spinner in his squad, Karl Carver, who will miss Thursday’s second-team one-day Trophy final against Middlesex at Headingley as a result.